London, August 2014  With Aperio® battery-powered locks, a full range of integration options comes as standard. 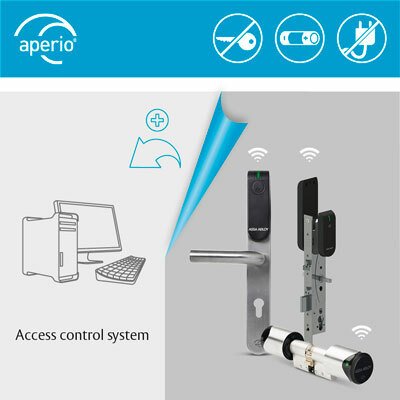 Access control manufactures choosing to integrate with Aperio® can pick between multiple online and offline possibilities. Recent data published by IMS Research suggests that sales of electronic locks will increase by more than 10% between 2010 and 2016. This represents a major change in the scope of the access control industry. With its Aperio® wireless range, ASSA ABLOY offers integrators an easy way to enhance their product portfolio with the latest electronic locks, explains Chris Bone, Vice President Access Control Solutions EMEA at ASSA ABLOY. Online Aperio® integration provides a link from the system via a communications hub to the wireless access controlled doors. It is supported by three different hub varieties. The Aperio® RS485 hub connects up to 8 doors per hub. The IP hub connects up to 8 doors via a high-speed, encrypted TCP/IP connection. A Wiegand interface hub provides a single door connection to the access control system. Chris Bone says: Aperio® online integration allows our integrators to select the right hub for their system and user requirements. And, ultimately, Aperio® gives their customers the maximum possible variety of choices to upgrade their doors wirelessly in the most efficient and flexible way. Offline Aperio® integration supports both the Aperio® data on card model and the Standard Offline Access Application (SOAA), an open standard developed by ASSA ABLOY and other industry leaders. Our wide range of integration options for Aperio® ensures that customers have a choice in selecting the best solution for their wireless access control needs. This range of choices includes both online and offline technologies, which of course can also be mixed on a single system for maximum flexibility, adds Chris Bone. With the future growth forecasted for this market, ASSA ABLOY has appointed Gareth Ellams as Aperio® Business Development and Key account Director, EMEA. His industry expertise makes him the perfect fit for managing ASSA ABLOY's vital OEM relations. Photo: AA_Aperio_Technology_integrators.jpg Photo caption: With Aperio® battery-powered locks, a full range of integration options comes as standard. Photo: ASSA ABLOY For more information please contact: Thomas Schulz EMEA Marketing and Communications Manager ASSA ABLOY Access Control Solutions Phone: +49 (0) 30 8106 2970 E-mail: thomas.schulz@assaabloy.de About ASSA ABLOY As the global leader in door opening solutions, ASSA ABLOY offers a more complete range of door opening solutions than any other company on the market. In the fast-growing electromechanical security segment, the Group has a leading position in areas such as access control, identification technology, entrance automation and hotel security. Since its formation in 1994, ASSA ABLOY has grown from a regional company into an international group with around 43,000 employees and sales of more than SEK 47 billion.